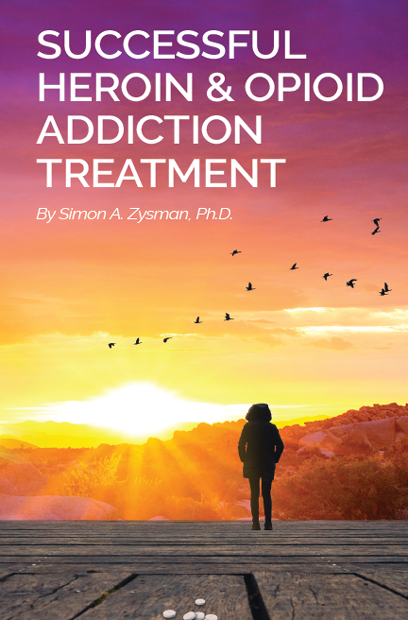 Dr. Simon Zysman is one of the nation's most prominent and well known clinical psychologists in the treatment of the addiction to heroin and opioids (the most commonly prescribed pain medication). Why should I purchase this book? This book provides new insight and knowledge about heroin and opioid addiction. This new knowledge may save your life, if you are an opiate addict, a family member, friend, neighbor, and help you to develop a better understanding of the disease concept of addiction. What is different about this book than other similar books? This book is written by a Clinical psychologist who is a pioneer in the field of addiction and has been treating active addicts since 1982. He had developed a method of successfully treating heroin and opioid addicts in New York and was invited to speak in front of the New York State Task Force on Heroin and Opiate Addiction. How did you come up with the price of the book? Two years of research and writing. Who is Simon A. Zysman, Ph.D. anyway? 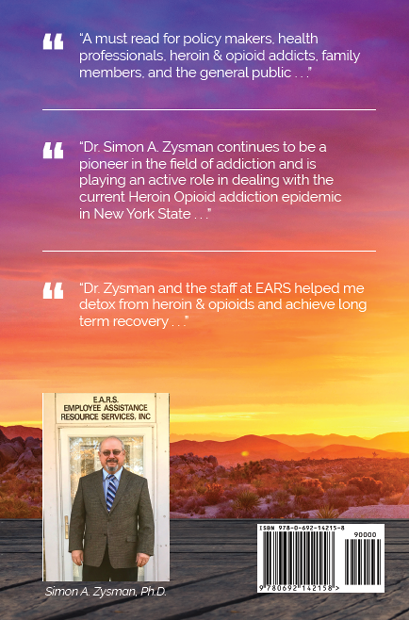 Dr. Zysman is a pioneer in the field of Addiction Treatment and founder of the EARS Program. He earned his Bachelors Degree (BA) in Psychology from Queens College, Master Degree (MS) in School Psychology from Brooklyn College, Doctoral Degree (Ph.D.) in Clinical Psychology from Florida Institute of Technology (Florida Tech), Post Graduate Training in Clinical and Experimental Hypnosis from the Institute for Research in Hypnosis in NYC, and Post Doctoral Training in Psychotherapy and Psychoanalysis from The Long Island Institute of Psychoanalysis at Nassau County Medical Center. Dr. Zysman is a former Member of the Board of Directors and Special Consultant to the President of Hempstead General Hospital; Member of the Board of Directors of Hempstead Nursing Home; Executive Director of Freeport Hospital; and Shareholder in a 250 bed Inpatient Detox and Substance Abuse Rehabilitation Facility in Pennsylvania. Address: Employee Assistance Resource Services, Inc.
©Copyright 2018. Customized with by Long Island Media Inc. with Template by Colorlib.